A Russian Soyuz spacecraft rocketed into orbit and set off after the international space station Sunday, carrying two fresh crew members and a U.S. computer game designer who paid some $30 million for a chance to follow in his astronaut father's footsteps. Mounted on the same launch pad Yuri Gagarin used for the first manned spaceflight nearly five decades ago, the Soyuz TMA-13 vehicle took off on time at 3:01:29 a.m. EDT (1:01:29 p.m. local time) and quickly climbed away through a clear afternoon sky at the Baikonur Cosmodrome in Kazakhstan. Nine minutes later, the capsule entered its planned preliminary orbit. On board are Soyuz commander and Expedition 18 flight engineer Yury Lonchakov, Expedition 18 commander Mike Fincke and Richard Garriott, the sixth space tourist to book a flight to the international space station. Garriott, the son of former Skylab and shuttle astronaut Owen Garriott, is the designer of a series of successful multiplayer computer games. He said before launch "this price tag is the majority of my wealth." "The reason why it's worth it to me is in many ways, this is the goal I've been working towards for a significant portion of my adult life," he said. "(My crewmates) gave pursued this as their profession and invested their professional life in achieving this goal. Though the path that has led me here has been quite different, I share with them the desire and joy and motivation to reach orbit." Television views from inside the Soyuz TMA-13 capsule durirng the climb to space showed Garriott in the right seat, Lonchakov in the center and Fincke to his left. All three appeared in good spirits, smiling and waving at the camera from time to time. Lonchakov even fielded a few casual questions from mission control. "How do you feel?" 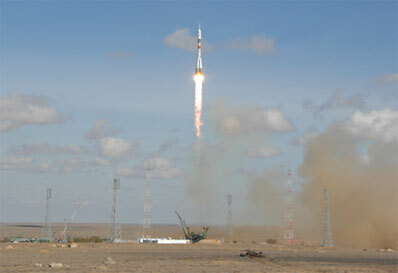 a Russian space official asked as the ship accelerated toward space. "How are your crewmates, to your left and to your right?" "They are absolutely great guys," Lonchakov said. "They are real space explorers." Fincke, Lonchakov and Garriott are scheduled to dock with the international space station around 4:30 a.m. Tuesday. They will be welcomed aboard by Expedition 17 commander Sergey Volkov, flight engineer Oleg Kononenko and Gregory Chamitoff, a NASA astronaut. Garriott will join Volkov and Kononenko for their trip back to Earth on Oct. 23, using the Soyuz TMA-12 spacecraft that carried the two cosmonauts into space last April. Chamitoff, launched aboard the shuttle Discovery on May 31, will remain aboard the station with Fincke and Lonchakov until late next month when the shuttle Endeavour delivers his replacement, astronaut Sandra Magnus. Garriott, known as Lord British in his computer game Ultima, grew up near the Johnson Space Center in Houston and was disappointed when doctors told him poor vision would rule out any chance of joining the astronaut corps. "That just set me on the path of saying wait a minute, you can't tell me no," he said. "Literally, throughout my entire professional career, I've been investing in the privatization of space, everything from companies like Spacehab, which flew hardware on the shuttles, to a number of suborbital spaceplane companies down through Space Adventures, the company with which I'm flying, helping to unlock the gates to private space travel. "My father, he was not shocked at all to see me pursuing this. In fact, he has helped put together some of those companies I've invested in down through the years towards the privatization of space. So I would like to believe, anyway, that I've been a modest player in opening the doors to allow a broader cross section of citizens to be able to participate in activities like this." In a reversal of fortune, Owen Garriott, one of the first astronauts to make ham radio calls from space, will chat with his son using ham gear later in the mission. "We've worked quite hard together in preparation for my flight," said Richard Garriott. "He has been my chief scientist, helping me put together all my science and educational activities for orbit. He will be at mission control in Moscow during my flight and so I'll get a chance to speak with him directly via the VHF radio links every day as part of my daily planning. "My father took the first ham radio to space with him on (shuttle mission) STS-9 and made the first contact from space almost exactly 25 years ago. So we didn't want to miss the opportunity to make the connection in reverse. He was calling down from space to me 25 years ago and so he's going to actually leave mission control to go to a ham radio facility specifically so that we can make that reverse contact from me to him." Garriott will spend about 10 days aboard the station before returning to Earth Oct. 23. Fincke Lonchakov and Chamitoff will turn their attention to preparing the station for the arrival of Endeavour around Nov. 16. Along with bringing Magnus to the station, Endeavour's crew also plans to deliver a second space toilet, two astronaut sleep stations, a galley and two racks of processing gear designed to recycle urine and condensation to supplement station drinking supplies. Up to this point, the station has primarily relied on the shuttle to deliver the bulk of the lab's fresh water. But the shuttle is scheduled to be retired in 2010 and on-board recycling is required. If the equipment delivered aboard Endeavour works as planned, NASA and the Russians hope to increase the station's crew size to six next year. But it will take months to verify the system is, in fact, operating normally and producing pure water. "Our biggest question now is to get our life support systems working so that we have enough for six people," Fincke said. "Right now, we're running kind of a water deficit and it's being supplemented by the shuttle. Without the shuttle flying, we really have to manage our water, so our water racks are going to be really important to us so we can recycle a lot of our water. That's going to be key. "We have a 90-day test period to see if they're going to actually be able to use that water. That water is also going to be used not just for drinking and food preparation but also for oxygen generation, which is a key component in life support. Because I think we're all pretty much addicted to breathing!"